This workshop demonstrates how the 2nd Edition of Mind Over Mood (published in 2016) reflects developments in evidence-based practice over the past two decades and how it can help therapists integrate the art and science of psychotherapy. DESCRIPTION: Many therapists turn to self-help manuals for ideas of how to teach skills that can boost client progress. How do you artfully tailor these manuals to fit the needs of an individual client? Padesky demonstrates how to make therapy more effective by selectively matching evidence-based skills to particular client moods and using mood measures to track progress. 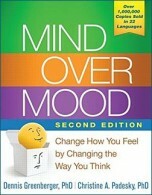 She shows therapists how to strategically assign chapters from the 2nd Edition of Mind Over Mood (Greenberger & Padesky, 2016) which includes 60 worksheets designed to help clients learn skills drawn from CBT, mindfulness, positive psychology, acceptance therapies, and happiness research.